Literature can be defined as a branch of art by which people express their emotions, thoughts, imaginations and ideals verbally or in written through language. It is one of the many fields utilized by social studies courses that inherently involve several social disciplines. Several different type of literary works have been used as teaching materials in social studies teaching. These primarily involve novels, stories, memoirs, biographies, travel writings, sagas, epics, articles, proverbs, songs, idioms, legends, poems, tales and theater plays. The aim of this study is to determine the extent to which social studies teachers use literary works in their courses. Phenomenology among qualitative methodologies was used during the research. The study group consists of 32 social studies teachers working in Bartın province as of 2015-2016 academic year. Structured interview was used as the data gathering tool. The data obtained within the frame of the study were analyzed using content analysis. As a result of the research, the majority of participating teachers were found to be inclined to use literary works in their courses, although they find the use of literary works in curricula and course books qualitatively and quantitatively inadequate. Akkuş, Z. (2006). Sosyal Bilgiler Öğretiminde Destanlarin Kullanimi [The Use Of Epics In The Teaching Of Social Science.] Atatürk University Kazım Karabekir Faculty of Education Journal Dergisi (KKEFD), 14, 31-48. Akyol, Y. (2011). 7. Sınıf Sosyal Bilgiler Dersi Türk Tarihinde Yolculuk Ünitesindeki Kazanımlar ve Gagne’nin Öğrenme Ürünleri [Gains in the unit the journey through the turkish history in 7th grade social studies course and Gagne’s learning outcomes.] Unpublished master’s thesis. Celal Bayar University, Institute of Social Sciences, Manisa. Altun, A. and Ata, B. (2008). Türkiye’de sosyal bilgiler eğitim anabilim dalındaki akademisyenlerin ve öğretmen adaylarının başvuru kitapları üzerine düşünceleri. [The Opinions of Academicians and Prospective Teachers on Reference Books at the Departments of Social Studies Teachers Education in Turkey.] Kafkas Üniversitesi Sosyal Bilimler Enstitüsü Dergisi, 2, 27-45. Altunay-Şam, E. (2011). “Şu Çılgın Türkler” romanının kuruluş savaşı bilgisini öğrenmeye etkisi. [The Effect Of “Şu Çilgin Türkler” On Learning The “War Of Independence Information”]. NWSA E-Journal of New World Sciences Academy Education Sciences, 6 (4), 2555-2568. Altunay-Şam, E. and İskender-Kılıç, P. (2011). Tarihsel romanın eğitimsel işlevi üzerine bir çalışma: “diriliş” romanı örneği. [The Study on Educational Function of Historical Novel: In Case of Diriliş Novel] Ondokuz Mayıs University Faculty of Education Journal, 30 (1), 123-144. Arslan, E. (2014). Ortaokul 7. sınıf sosyal bilgiler dersinde hikâye anlatım yönteminin akademik başarıya etkisi. [The effect of storytelling method on academic success in secondary school 7th grade social studies course]. Unpublished master’s thesis. Gaziantep University, Institute of Social Studies, Gaziantep. Bacak, S. (2008). İlköğretim 5. sınıf sosyal bilgiler dersinde öykü tabanlı öğrenme yaklaşımının öğrenenlerin akademik başarı ve yaratıcılıklarına etkisi. [Effect of story-based learning approach on academic success and creativity of learners in primary school 5th grade social studies course]. Unpublished master’s thesis. Celal Bayar University, Institute of Social Sciences, Manisa. Beldağ, A. and Aktaş, E. (2016). Sosyal bilgiler öğretiminde edebî eser kullanımına ilişkin öğretmen ve öğretmen adaylarının görüşleri. [Teachers’ and teacher candidates’ opinions on use of literary works in social studies teaching.] Erzincan University Faculty of Education Journal, 18 (2), 953-981. Bölücek, B. (2008). Sosyal bilgiler öğretiminde türkülerden yararlanmanın öğrencilerin akademik başarısına etkisi. [The Effect of Folk Songs on the Academic Success in the Teaching of Social Studies]. Unpublished master’s thesis. Gazi University, Institute of Education Sciences, Ankara. Büyüköztürk, Ş., Kılıç-Çakmak, E., Akgün, Ö. E. Karadeniz, Ş. and Demirel, F. (2008). Bilimsel araştırma yöntemleri. [Scientific Research Methods]. Ankara: Pegem A Yayıncılık. Çencen, N. (2017). Ortaokul öğrencilerinin Türkiye Cumhuriyeti İnkılâp Tarihi ve Atatürkçülük dersinde tarihsel mektupların kullanımına ilişkin görüşleri: Ankara ili ODTÜ geliştirme vakfı ortaokulu örneği. [Secondary School Students' Views on the Use of Historical Letters in Turkish Republic History of Revolution and Kemalism Course: Ankara, ODTÜ Geliştirme Vakfı Middle School Example] Education and Science, 42 (192), 193-210. Çencen, N. and Akça-Berk, N. (2014). Ortaöğretim T.C. İnkılâp Tarihi ve Atatürkçülük Dersinde “şiir kullanımına” ilişkin öğretmen görüşleri. [Perspectives of the Teachers Related to the “Use of Poem” in Secondary Education Turkish Republic Revolution History and Kemalism Course]. Turkish History Education Journal, 3 (1), 1-23. Çengelci, T. (2013). Sosyal bilgiler dersinde yararlanılan toplumsal ve kültürel kaynakların belirlenmesi. [Determining social and cultural resources being used in the social studies course]. Electronic Journal of Social Studies, 12 (43), 219-236. Çifçi, T. (2011). Sosyal bilgiler öğretiminde tarihi romanların kullanımının öğrencilerin akademik başarısı üzerine etkisi. [The effect of using historical novels on students’ academic achievement in teaching social studies]. Unpublished master’s thesis. Gazi Univerity, Institute of Education Sciences, Ankara. Demir, S. B. (2011). Sosyal bilgiler öğretim programına göre tasarlanmış hikâyelerin etkililiği. [Effectiveness of stories designed based on social studies curriculum]. Unpublished Doctorate Thesi. Marmara University, Institute of Education Sciences, İstanbul. Doğanay, A. (2005). Social Studies Teaching. In C. Öztürk and D. Dilek (Ed. ), Hayat Bilgisi ve Sosyal Bilgiler Öğretimi [Life Sciences and Social Studies Teaching] (pp. 17-52). Ankara: Pegem A Publishing. Dönmez, C. and Altıkulaç, A. (2014). Sosyal bilgiler öğretmen adaylarının Ortaokul T.C. İnkılâp Tarihi ve Atatürkçülük dersi konularının öğretiminde tarihsel kaynakların kullanımına yönelik görüşleri. [Social studies teacher candidates’ opinions regarding using historical sources in teaching of T.R. history of the revolution and Kemalism course in secondary school] Kastamonu Education Journal, 22 (3), 923-942. Er, H. (2008). İlköğretim öğrencilerine sosyal bilgiler eğitiminde biyografi öğretimi çerçevesinde Atatürk’ün hayatı nasıl anlatılmalıdır? [How should Atatürk’s life be taught to primary school students in social studies education within the scope of biography teaching]. In, International Symposium on Social Studies Teaching Proceedings Book (pp. 388-394). Çanakkale: Çanakkale Onsekiz Mart University Print. Er, H. (2010). Sosyal bilgiler eğitimi kapsamında ilköğretim öğrencilerinin "biyografi" kullanımına ilişkin görüşleri. [Opinions of primary school students on use of “biography” within the scope of social studies education]. Unpublished doctorate thesis. Gazi University, Institute of Education Sciences, Ankara. Er, H. and Şahin, M. (2012). Sosyal bilgiler dersinde “biyografi” kullanımına ilişkin öğrenci görüşleri. [Student opinions on the use of “biography” in social studies course]. Journal of Turkish Education Sciences, 10 (1), 75-96. Erdem, R. (2010). Sosyal bilgiler öğretiminde biyografi kullanımı. [Use of biography in social studies teaching]. Unpublished master’s thesis. Niğde University, Institute of Social Studies, Niğde. Erdoğan, N. (2007). İlköğretim sosyal bilgiler dersi tarih konularının öğretiminde resimlendirilmiş öykülerin tarihsel düşünme becerilerinin gelişimine etkisi. [The effect of illustrated stories on the development of historical thinking skills in primary education social studies course history subjects]. Unpublished master’s thesis. Marmara University, Institute of Education Sciences, İstanbul. Field, H. (2009). Sosyal bilgilerin tanımı, amacı, önemi ve Türkiye’deki yeri. [The definition, aim, importance of social studies and its place in Turkey]. In R. Turan, A. M. Sünbül and H. Akdağ. (Eds. ), New Approaches in Social Studies Teaching I (ss. 1-24). Ankara: Pegem A Publishing. Fredericks, A. D. (2007). Much more social studies through children’s literature: A collaborative approach. London: Teacher Ideas Press. Gevenç, S. (2014). Sosyal bilgiler öğretiminde fıkraların kullanımı. [The use of jokes in social studies teaching] Unpublished master’s thesis. Niğde University, Institute of Education Sciences, Niğde. İbret, B. Ü., Karasu-Avcı, E., Karabıyık, Ş., Güleş, M. and Demirci, M. (2017). Sosyal bilgiler öğretmenlerinin görüşlerine göre değerlerin öğretiminde edebi ürünlerin kullanımı. [The use of literature products in teaching the values by social studies teachers] International Journal of Turkish Education Sciences, 5 (9), 104-124. Kaya, E. and Ekiçi, M. (2015). Sosyal bilgiler öğretiminde gezi yazılarından yararlanma: Gülten Dayıoğlu’nun gezi yazıları örneği, [Usage of travel writings in social studies teaching: Gülten Gayioğlu case travel writings]. Turkish Journal of Social Researches 19 (1), 87-114. Kaymakcı, S. (2008). İlköğretim öğrencilerinin Atatürk’ün Gençliğe Hitabesi’ni anlama ve tarihi olaylarla ilişkilendirme düzeyine bir bakış. [An overview of primary school students’ level of understanding Atatürk’s Address to the Turkish Youth and associating it with historical events]. In, International Symposium on Social Studies Teaching Proceedings Book (pp. 388-394). Çanakkale: Çanakkale Onsekiz Mart University Print. Kaymakcı, S. (2010). Sosyal bilgiler öğretiminde çalışma yaprakları kullanımının öğrencilerin akademik başarılarına ve derse karşı tutumlarına etkisi. [Effect of worksheet usage in social studies teaching on students’ academic success and attitude towards the course]. Unpublished doctorate thesis. Gazi University, Institute of Education Sciences, Ankara. Kaymakcı, S. (2013). Sosyal bilgiler ders kitaplarında sözlü ve yazılı edebî türlerin kullanım durumu. [The usage situation of oral and written literary works in social studies textbooks]. Dicle University Ziya Gökalp Faculty of Education Journal, 20, 230-255. Kaymakcı, S. (24-26 May 2012). İlköğretim 4. ve 5. sınıf sosyal bilgiler ders kitaplarında edebî ürünlerin kullanımına bir bakış. [An overview of use of literary works in primary education 4th and 5th grade social studies textbooks]. Presented in 11th International Symposium on National Classroom Teaching, Rize. Kaymakcı, S. and Er, H. (2009). Sosyal bilgilerde biyografi kullanımı. [Use of biography in social studies]. In M. Safran (Ed. ), Social Studies Teaching (s. 413-431). Ankara: Pegem A Publishing. Kaymakcı, S. and Er, H. (2013). Sosyal bilgiler öğretim programı ve ders kitaplarında biyografinin kullanımı. [The Usage of Biography in Social Studies Curricula and Textbooks]. Mehmet Akif Ersoy University Faculty of Education Journal 13 (25), 198-224. Keskin, S. (2008). Romanlarla tarih eğitimi ve öğretimi. [History teaching with novels] Unpublished master’s thesis. Selçuk University, Institute of Social Sciences, Konya. Krey, D. (1998). Children’s literature in the social studies: Teaching to the standards. NCSS Bulletin 95. Washington, DC: National Council for the Social Studies. Kuran, Ş.B. and Ersözlü, Z. N. (2009). Sınıf öğretmenlerinin çocuk edebiyatına ilişkin görüşleri. [Opinions of classroom teachers on children’s literature]. Yüzüncü Yıl University Faculty of Education Journal, 6 (1), 1-17. Kuş, E. (2012). Nicel-nitel araştırma teknikleri. [Quantitative-qualitative research methods]. Ankara: Anı Publishing. Küçükoğlu, H. (2010). Importance of literature in children’s development with some suggested activities. In, D. Şahhüseyinoğlu & D. Ilisko (Eds. ), How Do Children Learn Best? (pp.144-157), Ankara: Researcher Children Center. McGowan, T. ve Guzzetti B. (1991). Edebiyat temelli sosyal bilgiler öğretimi. [Literature based social studies teaching] A. Doğanay (Transl.). Retrieved from http://turkoloji.cu.edu.tr/GENEL/doganay_01.pdf on 16/01 2018. MEB. (2005a). İlköğretim sosyal bilgiler dersi 4–5. sınıflar öğretim programı (taslak basım). [Primary education social studies course 4-5th grades curriculum and guidelines (draft issue)] Ankara: MEB. MEB. (2005b). İlköğretim sosyal bilgiler dersi 6–7. sınıflar öğretim programı ve kılavuzu (taslak basım). [Primary education social studies course 6-7th grades curriculum and guidelines (draft issue)] Ankara: MEB. MEB. (2018). Sosyal bilgiler dersi öğretim programı (ilkokul ve ortaokul 4, 5, 6 ve 7. sınıflar). [Social studies course curriculum (primary and secondary school 4th, 5th, 6th and 7th grades)] Ankara: MEB. Mertol, H. (2008). İlköğretim sosyal bilgiler dersinde çocuk edebiyatı ürünlerinin kullanımına yönelik öğretmen görüşleri ve uygulamaları. [Teacher opinions and applications regarding the use of children’s literature works in primary teaching social studies course]. In, International Social Studies Teaching Symposium Proceedings Books (pp. 265-269). Çanakkale: Çanakkale Onsekiz Mart University Print. Meydan A. ve Akdağ, H. (2014). Sosyal bilgiler dersinde öğretim teknolojileri ve materyal tasarımı. [Teaching technologies and material design in social studies course] In B. Tay and A. Öcal (Eds. ), Social studies teaching with special teaching methods (pp. 153-192). Ankara: Pegem A Publishing. Miles, M. B.ve Huberman, A. M. (1994). Qualitative data analysis: An expanded sourcebook. Thousand Oaks, California: SAGE Publications, Inc.
Neitz, L. J. (2002). Impact of children’s literature as an ancillary component to the social studies. Unpublished master’s thesis. Retrieved from https://files.eric.ed.gov/fulltext/ED469403.pdf on 07/05/2018. Oruç, Ş. (2009). Sosyal bilgiler 6. sınıf ders kitaplarında edebi ürünler. [Literary works in social studies 6th grade textbooks]. Turkish Journal of Social Researches, 13 (2), 9-24. Oruç, Ş. and Erdem, R. (2010). Sosyal bilgiler öğretiminde biyografi kullanımının öğrencilerin sosyal bilgiler dersine ilişkin tutumlarına etkisi. [Effect of biography usage on attitude of students towards social studies course]. Selçuk University Ahmet Keleşoğlu Education Faculty Journal, 30, 215-229. Öztürk, A. (2002). Tarih öğretiminde tarihi romanların kullanılması. [Use of historical novels in history teaching]. Unpublished master’s thesis. Gazi University, Institute of Education Sciences, Ankara. Öztürk, C. ve Otluoğlu, R. (2002). Sosyal bilgiler öğretiminde yazılı edebiyat ürünlerini ders aracı olarak kullanmanın duyuşsal davranış özelliklerini kazanmaya etkisi. [The effect of using literary materials to acquire affective behaviors in social studies teaching]. Marmara University Atatürk Education Faculty Journal of Education Sciences, 15, 173-182. Patton. M. Q. (2014). Nitel araştırma ve değerlendirme yöntemleri. [Qualitative research and evaluation methods]. M. Bütün, S. Beşir Demir (Transl. Ed.). Ankara: Pegem A Publishing. Sever, S. (1998). Demokratik kültür edinimi sürecinde dil ve edebiyat öğretimi. [Language and literature teaching in democratic culture acquisition process]. Journal of Education for Life, 56, 4-5. Sömen and Göksu (2017). Sosyal bilgiler öğretmenlerinin derslerinde sözlü ve yazılı edebi ürünleri kullanmaları durumu. [Social studies teachers’ oral and written literary works usage situation in their courses]. Turkish Studies, Volume 12/18, p. 561-576. Şimşek, A. (2000). İlköğretim sosyal bilgiler dersinin öğretiminde hikaye anlatım yönteminin (storytelling) kullanımı. [Use of storytelling method in primary education social studies teaching]. Unpublished master’s thesis. Gazi University, Institute of Social Sciences, Ankara. Şimşek, A. (2006a). Bir öğretim materyali olarak tarihsel romana yönelik öğrenci ve öğretmen görüşleri. [Students’ and history teachers’ opinions towards historical novel as a teaching material]. TOJET (The Turkish Online Journal of Educational Technology), 5 (4), 73-81. Şimşek, A. (2006b). İlköğretim sosyal bilgiler dersinde tarihsel hikâyeye yönelik öğrenci görüşleri. [The Opinions of Students About Historical Story in Social Studies in Elementary Schools]. Gazi University Gazi Education Journal, 26 (11), 187–202. Tekgöz, (2005). İlköğretim 7. sınıf sosyal bilgiler dersinde edebiyat temelli öğretimin öğrenci başarısına etkisi. [Effect of literature based teaching on student success in primary education 7th grade social studies course]. Unpublished master’s thesis. Çukurova University, Institute of Social Sciences, Adana. Tokcan, H. (2016). Sosyal bilgiler ve edebiyat. [Social studies and literature]. In H. Tokcan (Ed. ), Oral and Written Literature Reviews in Social Studies (pp.1-24) . Ankara: PegemA. Tokdemir, M. A. (2016). Osmanlı Devleti’nin kuruluşunun öğretilmesinde tarihsel roman kullanımı: Devlet ana romanını okumak. [Teaching Ottoman Empire’s Foundation Via Using Historical Novels: Reading The Novel Of Devlet Ana]. Kastamonu Education Journal, 24 (3), 1469-1486. Top, M. (2009). İlköğretim 8. sınıf T.C. İnkılâp Tarihi ve Atatürkçülük dersinin öğretiminde edebî ürünlerin kullanımının öğrenciye başarısı ve tutumuna etkisi. [Effect of the use of literary works in 8th grade Revolution and Kemalism courses on students’ attitude and success]. Unpublished master’s thesis. Marmara University, Institute of Education Sciences, İstanbul. Topçu, E. and Kaymakcı, S. (2018). Sosyal bilgiler öğretiminde menkıbelerin kullanılma durumuna ilişkin öğretmen görüşleri. [Teachers’ Perceptions About the Usage of Legends in Social Studies Education]. 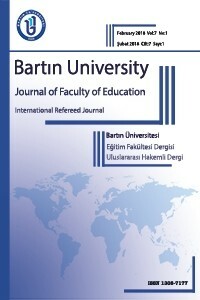 Erzincan University Faculty of Education Journal, 20 (1), 281-305. Ünlü, İ. (2016). Sosyal bilgiler öğretmenlerinin ders materyali olarak edebi ürün kullanımına yönelik görüşleri. [The viewpoints of social sciences teachers on the use of literary genres as class materials]. International Journal Of Eurasia Social Sciences, 7 (22), 120-136. Ünlü, İ. and Kaşkaya, A. (2018). Sosyal bilgiler dersi öğretmen adaylarının, ek kaynak ve materyal olarak tarihi roman kullanma yeterliklerinin ders planları üzerinden incelenmesi. [Examining the social studies teacher candidates’ efficacy on using historical novels as additional sources and materials]. Turkish History Education Journal, 7 (1), 69-91. Yeşilbursa, C. C., Sabancı, O. and Hamarat, E. (2013). Sosyal bilgiler ders kitaplarında edebi ürünlerin kullanımı. [Use of literary works in social studies textbooks] In B. Akbaba (Ed. ), Social Studies Subject Area Textbook Research Guide (pp. 145-206). Ankara: Pegem A Publishing. Yeşilbursa, C.C. and Sabancı, O. (2015). Sosyal bilgiler öğretmen adaylarının sosyal bilgiler öğretiminde edebi ürünlerin kullanımına yönelik görüşleri. [Pre-Service Social Studies Teachers’ Views on Using Of Literary Works in Social Studies Teaching]. Mehmet Akif Ersoy University Faculty of Education Journal, 15 (36), 19-33. Yıldırım, A. and Şimşek, H. (2011). Sosyal bilimlerde nitel araştırma yöntemleri. [Qualitative research methods in social studies]. Ankara: Seçkin Publishing. Yıldırım, M. (2017). Sosyal bilgiler öğretmenlerinin derslerinde edebi ürün kullanma durumları (Erzurum örneği). [Social studies’ teachers literary work usage situation in their courses (Case of Erzurum)]. Unpublished master’s thesis. Atatürk University, Institute of Education Sciences, Erzurum. Yiğit, E. Ö. (2007). Öyküleştirme yönteminin 6. sınıf sosyal bilgiler programı ülkemizin kaynakları ünitesindeki öğrenci başarısı üzerine etkisi. [Effect of storyline method on student success in 6th grade social studies program sources of our country unit]. Unpublished master’s thesis. Abant İzzet Baysal University, Institute of Social Sciences, Bolu.